The only supplement that actually adds back antibodies & immune factors to help repair a compromised immune system. Colostrum for dogs is a natural concentrated source of antibodies that supports overall immune health. Made in the USA and strictly regulated by the NASC (National Animal Supplement Council)! Give your dog nature’s first, and possibly most important, immune builder. Colostrum is that amazing substance that sustained your dog in its first days of life with potent, immune-stimulating nutrients. Now you can give your dog an extra jolt of that same powerful immune support and more! This concentrated powder contains more than 250 beneficial substances, 60 of which are important for immune rejuvenation. It is the richest source of the miracle molecules called transfer factors. Only these allow immune response factors to be transferred from donor to recipient in a form of passive immunity. Colostrum for Dogs vital restorative ingredient also helps improve GI health, fight yeast overproduction, and provides resistance to infection. Consequently, it excels at fighting off immune-related chronic diseases like Demodex. This natural whole food is a unique supplement because of the way it biologically transfers immune bolstering benefits to all mammals. Therefore, Colostrum for Dogs is one of the most powerful tools available to aid in recovery during Demodectic mange treatment, and afterwards to maintain maximum immune system health for your happy dog. 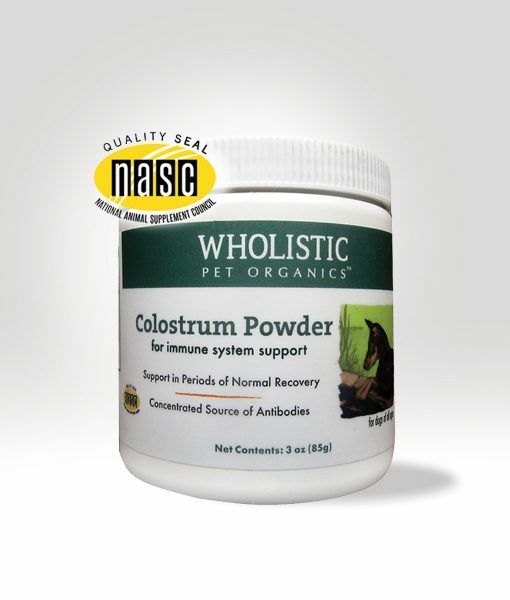 Wholistic Organics Colostrum for Dogs is the go-to supplement that many holistic practitioners recommend for pets that need a boost to their immune function during times of stress, illness, and periods of recovery. When selecting supplements for your pet, avoid human grade supplements when a quality pet version is available. Also, steer clear of processed pet foods with supplemental substances added. Formulations meant for humans were developed specifically for human bioavailability (the ability to be absorbed by the GI tract). Pets have specific metabolic rates, as well as compounding and delivery requirements unique to their systems. Therefore, so they do best with a customized supplement formulated just for their needs. Commercial pet foods containing omega acids, amino acids, vitamins, herbs, probiotics and other health supplements aren’t worth the money. Tests on dog foods claiming to provide their beneficial properties and microorganisms show the manufacturing process destroys them, rendering these additives useless (and sometimes ripe for becoming rancid). By the time the food is packaged and shipped, any benefit is history. Made in the USA • NASC Certified! Container contains roughly 48 teaspoons. 1/4 teaspoon scoop included. Immune work takes time. It can take up to 3 months to see the effects of any supplement and those with an immune deficit may take longer. Bowel tolerance test: Digestive upset can result when anything new is introduced, or reintroduced if the dog is currently unaccustomed to having in its system. We recommend starting at a quarter of the recommended dose and increasing the amount slowly (2-3 weeks) until the full dose is reached. If diarrhea occurs and lasts for more than 2 days, drop back to the highest tolerated dose. I gave Annabelle the first colostrum yesterday so we’ll see. Ever since we gave her the Mite Avenge treatments that saved her life last year, I put her on a regimen of the immune system builders, and she has been so much better! If it’s like everything else you’ve recommended, I know it will help. She is our eight year old German Shepherd. We have fought mange off and on her whole life, and we almost lost her right before I found Mite Avenge! The doctor thought maybe she had finally had it and we should put her down. She wasn’t getting any better from the vet’s chemicals; she had lost major weight, was very shaky trying to walk and stand, had raw skin from chewing, and was miserable–poor thing! So I started doing hours of research and reading to find something that might work. This might sound dramatic, but we feel that God led me to your website. She was better after only twenty-four hours and we treated her for several months longer. She has had no flare-ups since then, but now it started turning hot down here in Texas and the stress of it is kicking in. We gave her a Mite Avenge treatment this weekend and will do that every week for a month or so until she is better again. We know how to catch it early now! She feels noticeably better after her bath and treatment! I love that it is natural and it doesn’t hurt her skin or mine. The vet chemicals are so strong that anyone who is on certain meds cannot even be around the dog for twenty-four hours after a dip. That is crazy! I will tell everyone about your company and products as I couldn’t be more impressed and happier that Mite Avenge saved Annabelle’s life. She runs around sometimes now like she is a puppy!